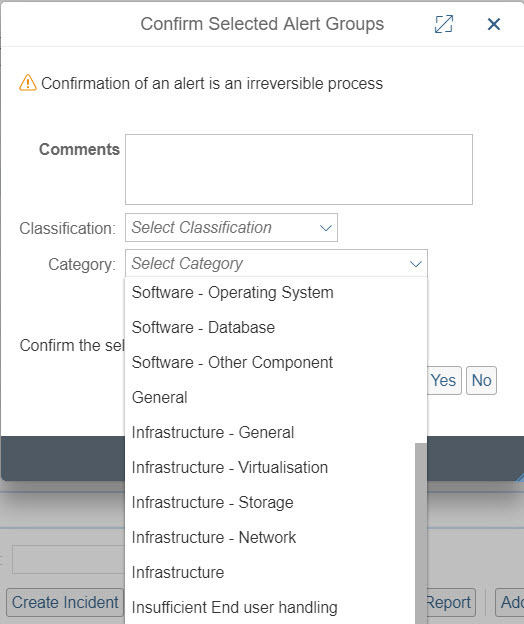 In Solution Manager 7.2, when confirming a BPMon alert (or in fact any alert) in the alert inbox, you can choose an alert classification and an alert category. These allow you to provide context to your alerts (why and where they occured). Of course you could also provide this context in the “Comments” field, but if you want to do reporting over the context, you need to use the classification and category. Both can serve as a basis for improving your alerting configuration and the implementation of your business processes. However, when using Business Process Monitoring, these might not be sufficient. This blog explains how to maintain your own classification and category. Customer IDES wants to have an alert classification “Handled by OCC” to be able to differentiate alerts that were handled via OCC from those that were not. In addition, they often experience critical situations due to incorrect handling of the system by the end users. So they would like to have an alert category “Insufficient End-user handling”. Alert classifications are available in table ACC_CLASSIFICS. To create a new classification, you have to create a new table entry. This should happen on the Development Solution Manager and from there be transported to your productive Solution Manager. 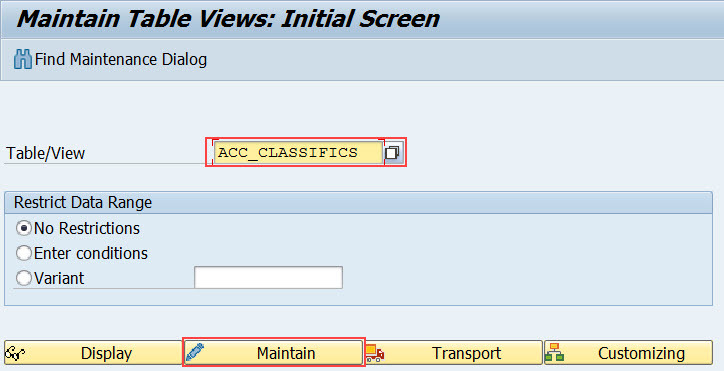 On the Development Solution Manager system, call transaction SM30, enter the name of table ACC_CLASSIFICS and choose “Maintain”. In the next screen, choose “New Entries”. Provide a classification ID and a description. Afterwards, save. Assign a customizing request. Remember that this request will need to be transported to the productive Solution Manager system for the alert classification to be available there. 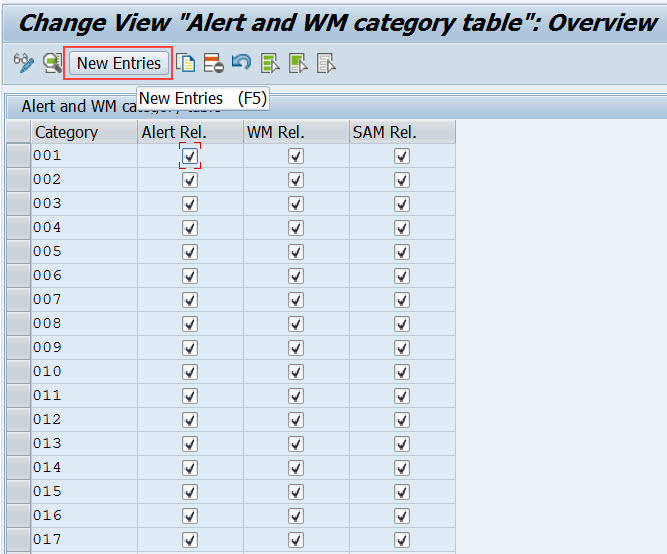 Alert categories are available in table ALR_WM_CATEGORY. 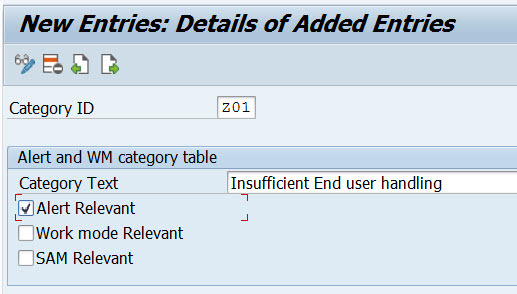 To create a new category, you have to create a new table entry. This should happen on the Development Solution Manager and from there be transported to your productive Solution Manager. 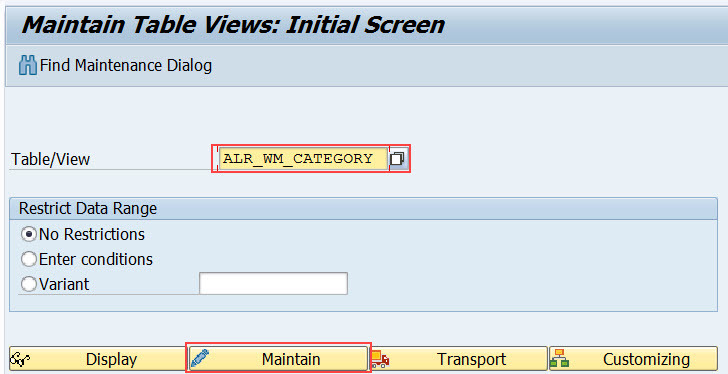 On the Development Solution Manager system, call transaction SM30, enter the name of table ALR_WM_CATEGORY and choose “Maintain”. In the next screen, choose “New Entries” to create a new alert category. Specify an ID and a description for the alert category. In addition, flag the “Alert Relevant” to ensure that the category will be available when confirming alerts. Afterwards, save. Assign your changes to a customizing request. Remember that this request will need to be transported to the productive Solution Manager system for the alert category to be available there. Now, when confirming an alert, you can choose the new alert category. 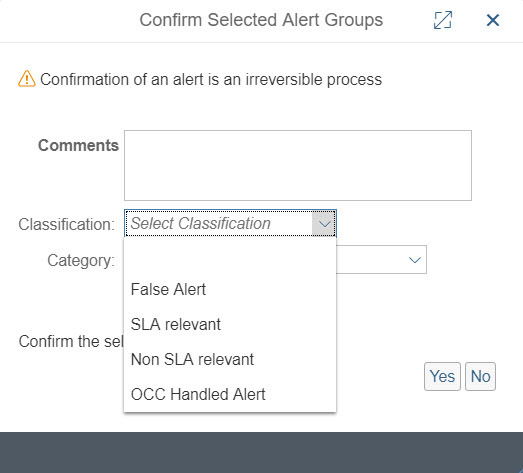 These new alert categories and alert classifications give you more detailed options when analyzing alerts that have occured in the past. This allows you to identify overall improvement potential in your monitoring configuration and your business process implementation by highlighting where and why most of the alerts occur. For further information about how to set up and use BPMon in SAP Solution Manager 7.2, see https://wiki.scn.sap.com/wiki/display/SM/Business+Process+Monitoring.